A man in his 40s was seriously wounded on Wednesday afternoon by an explosive set on a car in the coastal city of Nes Tziona. The bomb planted on the car detonated on the corner of Haminyan Harishon Street and Yitzhak Rabin Street. A police investigation has revealed that the car was standing at a stop light when the blast occurred. Video of the moments of the explosion was released later by Channel 2. The circumstances of the explosion are still being investigated, but it would appear the incident was criminally motivated as opposed to being a terrorist attack. Magen David Adom (MDA) medical forces evacuated the wounded man to Sheba Hospital in Tel Hashomer. 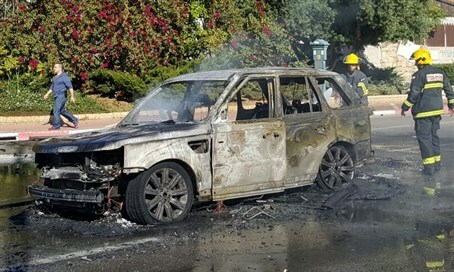 Senior MDA medic Ofer Fisher, who was first to arrive on the scene, said, "on the sidewalk adjacent to the car that went up in flames was lying a man around 40 years old, he was conscious with burns on his upper body." "We gave him initial medical treatment at the scene including bandaging, fluids and analgesics, and then evacuated him to the hospital while continuing treatment with his condition defined as serious." Following the explosion, Highway 4303 from Beit Oved Junction towards Nes Tziona was closed to traffic.